Andrew Meikle lived from 1719 to 27 November 1811. He was a millwright and agricultural engineer who invented the threshing machine and paved the way for the agricultural revolution that followed. The wider picture in Scotland at the time is set out in our Historical Timeline. Andrew Meikle was born in East Linton in East Lothian. His gravestone tells us he was "descended from a line of ingenious mechanics": in about 1711 his father had invented a winnowing machine in an age when agricultural machinery was usually seen as a threat to peoples livelihoods. 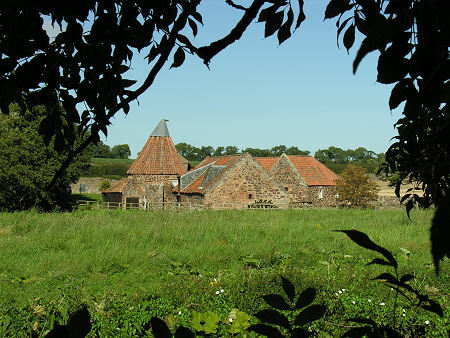 Meikle spent much of his working life as a millwright at Houston Mill in East Lothian, part of the Phantassie Estate owned by the Rennie family. In the 1770s the young John Rennie spent a great deal of time working with Andrew Meikle, and later credited Meikle with inspiring him to become a civil engineer. Meikle also designed mills, including the Dumfries Old Town Mill he built in 1781, which now houses the Robert Burns Centre. At around the same time, Meikle invented "spring sails" for windmills, allowing canvas designs that were very prone to storm damage to be replaced by a series of shutters operated by levers, allowing each shutter to be turned to offer little wind resistance in high winds or storms. Meikle is mainly remembered, however, for his later invention of the threshing machine. This allowed large scale mechanical separation of grain. Throughout history, grain had been separated by a highly laborious manual process involving flails. An effective threshing machine opened the way for the agricultural revolution that followed. Meikle patented his threshing machine in 1788. Widespread use of the threshing machine only followed after his death, but his contribution to the development of agriculture was such that in his later years he was given financial support by the President of the Board of Agriculture. There has been some debate about whether Meikle actually invented the threshing machine from scratch, or simply improved on a design that someone else had invented in the 1840s. The debate can be sidestepped by accepting that Andrew Meikle invented the first really useful and usable threshing machine.